A Gazetteer of English Place Names. The ability to search and download the surviving Irish census images free of charge. And the mapping section of the Family Search website. Finally, with my forthcoming talk at The Society of Genealogists in mind, something on the history of witchcraft. Posts will be spasmodic for the next month while I am busy with the job that I am not allowed to mention on social media – so of course I won’t. This job involves travelling to a northern industrial town some 270 miles away and it requires me to do so twice. Never my favourite destination it is particularly unappealing at this time of year. Bank Holiday weekend, the first day of the school half term and the world and all his wives are on the road. No way would I be undertaking this sort of driving but my trusty companion is manfully acting as chauffeur. It takes us five hours to progress 150 miles along the M6 and M5. We play put and take repeatedly with the cars in the neighbouring lane. A small child’s teddy waves at us. We wave back. This happens several times, much to the glee of the child. Then my driver realises that he has a Papa Smurf toy on his dashboard. There is a good reason for this. Let’s just say any resemblance between Papa Smurf and my chauffeur is purely deliberate. Papa Smurf waves cheerily next time the child passes us. We did inadvertently wave at the wrong car at one point but we are used to being thought slightly strange. We stop at services, along with everyone else who is hoping in vain that the congestion will lessen whilst they are off the road. There is barely a parking space and I try to manoeuvre myself back in the car without opening the door into the closely parked and exceedingly expensive looking car in the next space. Somehow I manage to bang the door into my nose. An interesting looking black eye begins to develop. These trips to the north involve an inordinate amount of food. The all you can eat breakfasts – and yes I can eat quite a lot, the three course evening meals, lunches – I never eat lunch. All this is designed to make me semi comatose just when I need to be alert. The bedroom in the motel is clearly designed for northern climates. Sadly this is a hot and humid spell and it is impossible to get the night time temperature below 23 degrees. Back home I have been victim of a couple of mail order situations. I am advised, on the basis of my previous ordering patterns, that I may be interested in a ‘skinny see through bandage dress’. Who on earth decided that my mundane books, household and stationery purchases might fit me for such an item? Then there is that moment when you realise that the vital packaging for returning a mail order item is in the bin under a layer of rice & chicken bones. I have been silent on the house renovations recently. They are almost done. Somehow moving from ‘almost done’ to actually done always seems to take a very long time. I did purchase a smart TV, sadly this did not come supplied with an operator smart enough to work out the subtleties of all its features. Various history projects are progressing nicely. My lovely ladies who are recording their memories of 1946-1969 have become a really cohesive group and are meeting up in various regions. Some submitted Mass Observation Diaries for May 12. What a wonderful idea. We could also record our lives on an ‘ordinary’ day for the benefit of our descendants. What did we wear? What did we eat? Wouldn’t it have been great if our ancestors had done this for us? Excited by the forthcoming work on the servicemen of the first world war with the local school. It is great to help the community become involved in enjoying history. As regular readers will know, recently I have spent time trying to discover as much as possible about those who perished in the fishing disaster off Clovelly in 1838 and their descendants. This was made more difficult by the paucity of records. The only list of names was in a local paper (subsequently repeated by other publications) and proved to be inaccurate. Although villages of origin were noted in conjunction with the names, there were no ages. As about half the bodies were never recovered, these victims have no death certificates and no burial records, which might have given further clues. Strangely, some seem to have burial records but no death registrations. Even allowing for the fact that some may have been registered as unknown deaths and subsequently identified in time for burial, this seems odd, especially as there were inquests. It was of course very early in the days of death registrations but this does not seem an adequate explanation. As a direct result of the tragedy, The Shipwrecked Mariners’ Association was formed 175 years ago and they were celebrating this milestone with the unveiling of a plaque commemorating the victims of the 1838 disaster. As the research progressed there were hints of a royal involvement in the event. 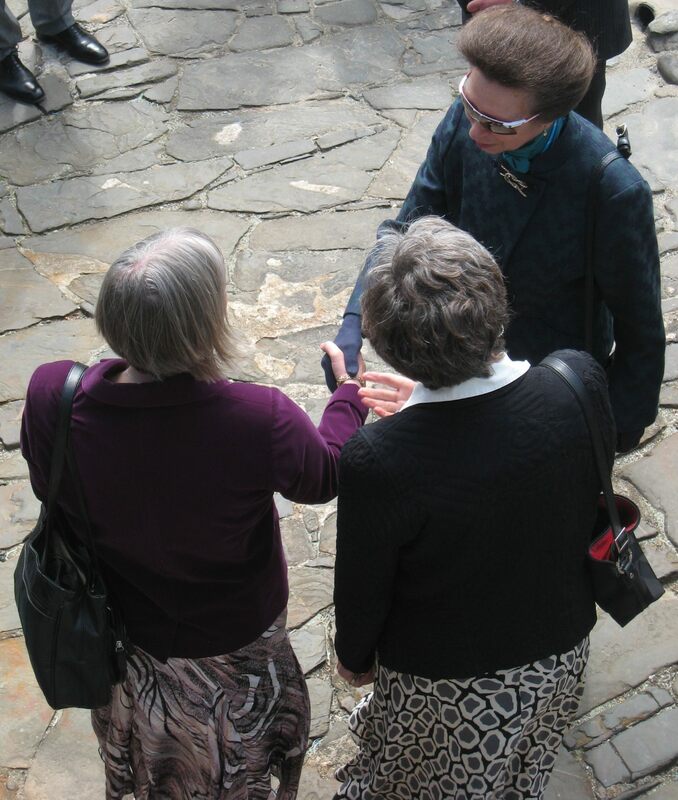 Initially this was all very hush hush but eventually it transpired that I and the descendants I had unearthed, would be invited to meet HRH Princess Anne, the Princess Royal. Great in theory but this involved posh, not only do I not do ‘posh’ but this was the sort of posh that was compatible with standing on a windy and possibly rainy, quayside having descended a steep cobbled street. Fortunately hats were deemed unnecessary and in the end the weather was kind, although my version of posh did not really go with flat shoes. I was tempted to send Mistress Agnes in my stead – warm and comfortable at least – but Master Christopher was reluctant to accompany her so she had to attend disguised as her twenty first century self. When the date of the event was set it was too good to be true, the day after the end of our annual Braund family reunion. Braunds would be descending on North Devon from near and far and may want to stay to witness the unveiling. Some Braund Society members were already involved in the day as descendants of the victims. A swift bit of negotiating and I gained permission for others to attend. On a lovely day I assembled in my designated position on Clovelly quay where I was to introduce some of the descendants to HRH. 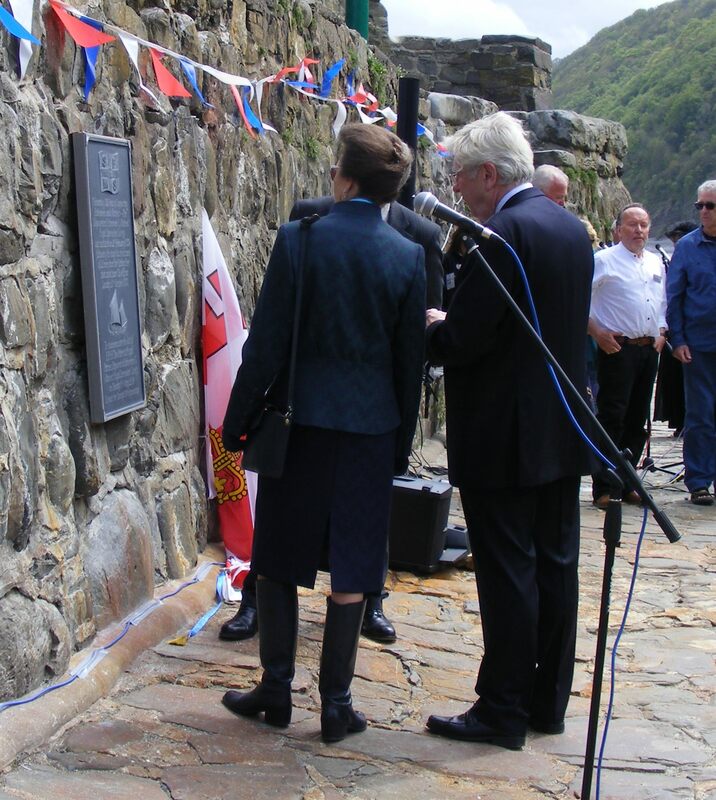 Having unveiled a fountain at the top of Clovelly, the Princess descended the cobbles and spent five minutes or so talking to each of the six assembled groups on the quay. HRH had clearly done her homework and spoke in an informed way to each group. The memorial was unveiled and a Cornish shanty group ‘Stamp and Go’ sung a song composed especially for the occasion. I thought my job researching the descendants was bad enough but when the composer contacted me for help with information, prior to writing the song, I knew who had drawn the short straw! My response went along the lines of, ‘Good luck with that one’. Not much scanning or rhyming potential in ‘Shipwrecked Fishermen and Mariners’ Royal Benevolent Society’ but they did a great job. The Braunds who were expecting only to spectate were thrilled that the Princess stopped to talk to them on her way back up the quay. Two of them appeared on the local news, even though the BBC manage to mis-spell one of their surnames. So I can now add shaking hands with a Princess and talking to her about research to the list of unexpected experiences to which my research has led.